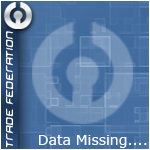 The Trade Federation has traditionally maintained a strict neutrality in its dealings with other governments and companies, provided that those companies act in an honorable and trustworthy manner. To that end the Trade Federation helped create the Treaty of Forsetti which laid the groundwork for the Galactic Concordiate whose the stated aims of the Concordiate include promoting mutual cooperation, economic interdependence, intergovernmental friendship, and collective defense in order to further peace and prosperity. The Galactic Concordiate (GC) is the largest neutral alliance in the galaxy and spans over 35 sectors and 650 planets. Founded in Year 14 with the ratification of the Treaty of Forsetti, the stated aims of the Concordiate include promoting mutual cooperation, economic interdependence, intergovernmental friendship, and collective defense in order to further peace and prosperity. 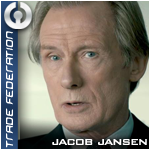 Relations between the Hapes Consortium and Trade Federation date back to Corbin Esco's reign as the first Viceroy of the Trade Federation. As the two governments grew so did their relations. This bond lead to the signing of the Neshig Accords, the first alliance of its kind for both the Trade Federation and Hapes Consortium. The alliance is an economic, military, and political partnership, meaning co-operative economic and industrial endeavors, mutual defense pact, and a joint foreign policy. Together with the Trade Federation, the Hapes Consortium shares jurisdiction over the sector of space called Neshig. Although not an official member of the department, Lord Ambassador is a honorary title reserved for the Viceroy of the Trade Federation. As Head of State, the Viceroy is considered the Chief Diplomat of the Trade Federation. The High Ambassador is the head of the Trade Federation Department of External Affairs. The High Ambassador is responsible for all external relations between the Trade Federation and other factions or governments. There is no diplomatic document the Viceroy signs without the High Ambassadors input. Because of this, the High Ambassador is considered one of the Viceroys most trusted advisers. Governments and corporations seeking to establish a relationship with the Trade Federation should contact the High Ambassador. 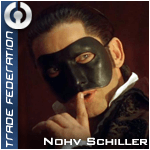 As former Viceroy and current Regent, Nohv Schiller serves as a senior advisor to the Department of External Affairs. 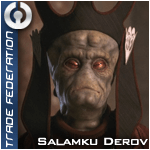 As Duceroy and second in command of the Trade Federation, Salamku Derov serves as a senior advisor to the Department of External Affairs.